Welcome to the third QPF Opening! This time we won't have one, but two fresh new troops to add to the rankings! Those with the most and second most votes in the voting round will share their forum in Underneath the Armos, which is currently vacant. They can keep the same name or decide on a new one once they have access. If you are not familiar with the rules or procedures, read them here. Posting in this topic will be limited to interested candidates showcasing one of their projects. It could be a quest or a tileset. How you showcase your work is completely up to you. Double posting is allowed if you are interested in a spot and you have a practical reason for doing so. You can also make another post later if you wish to show an update on your project provided you feel it would help you, but don't go overboard on it. No other forms of posting please. No opinions on peoples work. When the showcasing is over, I will announce it here, lock this topic, and then open up a poll. The showcasing should last 1 week unless I feel that we need more candidates. Posting permissions will remain on until the showcasing is over. The Legend Of Zelda: Pearl Of Shadows is a quest that really focus's on storytelling. It features a very unique story with plot twists aimed at your emotions. This is my first quest, and over my stay at PureZC, it's gotten better and better until now, where it's pretty well-known. I have improved so much over the past year or so, and I am really excited to show what I've got. Welcome; to the Pearl Of Shadows. One day in Hyrule's history, an evil came. Monsters and darkness were plaguing the land. Hyrule... Was a kingdom was magnificent mountains, peaceful lakes, and beautiful forests. Its citizens were proud to live in such a wonderful land... But when this day came, Hyrule was reduced to a wasteland. It was isolated from all nature and peace. People were literally choking from shadow. What could have caused this? To this day nobody knows... This was a curious time in Hyrule's history... How did it end? The most believed theory is this: the king killed something; the cause of the darkness... And broke it into three shards. Yes, killed. But the king also perished because of this as a result of some sort of disease. What caused this strange disease? Was it the thing he killed? Vaati came to Hyrule. He plagued the land until an untold hero came to defeat him. With his defeat, all of the monsters in Hyrule disappeared. Where did they go? Time faded the legend. People forgot about the Pearl Of Shadows. Does that mean it doesn't exist? Hm. Monsters started appearing all over Hyrule. Many Citizens think the shadows are coming again... To choke them and torture them. I do believe that they're right. It's only a matter of time before the shadows swallow them up, it's only a matter of time before the shadows finish what they started. For the past few weeks, I've been editing the storyline. I've completely modified it, and I have to say it's one of the best I've seen. I can't release it though, sorry! I didn't include the previous demo because well, I don't like it. In fact, I think it was terrible. Fading Hours - Undecided DOR tileset - This will have a REALLY epic storyline. Edited by ZebraStallion, 01 May 2009 - 03:15 PM. TLoZ: Hero's Shadow is going to be the very first quest I will actually finish. So keep in mind while reading that I am literally a newbie to ZQuest. Please don't think now that I'm therefore not able to use flags or set up a cool custom boss. I'm awaiting much from myself and I am willing to put the effort needed in this quest. The next important fact about it is that this quest is far from any form of playability. The whole project is still in the step of planning. So it happens that I know nearly every little detail about (my) Hyrule, the story, the dialogues, but haven't build any screen so far. The screens I will show here are examples I build for other reasons but they work to show them, presenting my skill of designing. 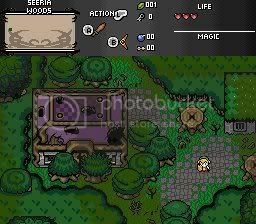 Having said this I am proud to show you the very first information about my project : The Legend of ZELDA: Hero's Shadow! One day dark clouds shade the calm idyll of Lauron village and monsters come crashing out of the forest to attack the villagers. Link trys to stop them but the strike of one of the monsters puts him out of action. Half-concious Link watches Kilian dropping his sword as a sign of surrender and leaving the destructed village with the monsters. The player begins his adventure in the villlage of Lauron. He's given some simple tasks by the villagers such as talking to them, pushing a block out of the way for someone, doing other stuff that introduces gameplay to the player. Then, he will practice combot with Kilian. Kilian gives the sword and the shield to Link and introduces him how to use them. The player will than be requested to clean up a cellar from a few rat like monsters (a fairly small dungeon to get used to stuff). When he's done and turns back, the village will be attacked. Kilian leaves town with the monsters, Link is half-concious by the monsters blow. Then, when every hope seems gone, a dark siluehette appears in front of Link. That dark being offers help 'cause it happens that he knows where to find Kilian, if Link does him 'a favor' in return. Oh noes, people think my temples are going to be cliche! Well, I wrote down that the temples are forest, fire and water themed beacuse it actually is the theme of them. But they will be designed after the 'shadow' they represent: the forest temple will represent the 'Shadow of the Skies', therefore it will also be wind themd. 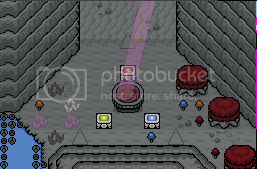 If I get it working reasonable the temple will need to be torn around like the stone tower temple in MM was. The fire temple will represent the 'Shadow of the Grounds' and will mainly have an earth theme. The water temple will represent the 'Shadow of the Absyss' and will have an ice theme. Since I spoiled the forest temple that heaviliy now, I won't spoil fire and water any further. The Temple of time will have such gimmicks such time traveling and for the light attribute also mirror puzzles and stuff. I hope I clarified. -Great story: Mysterious, dark, dramatic, epic! The player will be able to play as Link and Dark Link, depending on the quest status he will once even be able to switch absolutly free between both forms! Link and DarkLink will have a different feeling, while DarkLink deals more damage to monsters the guards of the towns will try to kill him and NPCs will avoid contact. Both will have an own set of items (DarkLink will fight more agressive, while Link will posess the shield and items that are more 'heroic' and less 'cruel') and a different subscreen. (I have a good scripter who offers help with the scripts needed). 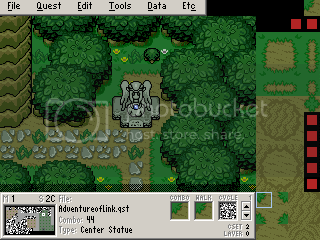 -Tileset: This quest will be built in a GB tileset. I'm awaiting Joes to start making the real deal. I will draw custom palettes and and various custom tiles! To get an idea of the style I'm going for have a look at my concept art of Link, a crossing of TP's epicness and the style of the oracle series! Not much left to say, I guess! Well, maybe I should say here that I'm quite often busy with school, but well, who isn't busy with school/job ? Edited by Sheik, 06 May 2009 - 03:13 PM. The Legend of Zelda The Sword of Light. Long ago in the land of Hyrule there was a boy in green (isn't there always) He saved the land from the Evil that lucked within the Darkness of the land and saved everyone with The Sword of Light. The sword was locked away in a Temple called the Temple of Light and no one set foot in there since. 150 years Later. Everyone has forgotton that the land was once under evil contoler and forgot about the Legend but deep with-in Tower of Hate the evil that was once Destoryed is coming back to haunt the land. There was a boy called Link who went to school with the prenciss called Zelda. They grew up with one and other and Link has a huge crush on her (which is why he dosn't speek around her or pepole that know her). Then one day Link gets a letter from Zelda Saying "Link please cheack the Temple of Light for me i feel somthing is wrong in there. 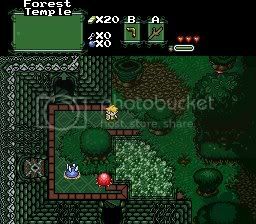 So Link set out to the Temple of Light but what he dosn't know is this is the beging of his adventure. Even know this is the longest story i've written it's still going to be a small quest so i can focus more time in one area. Yeah I'm just about to go on Exam Leave (and deuing that time i will have about 1 more hour on the PC per day if i don't have an exam) so dempending on the day that will depend on my work on this quest. Edited by Billy Ronald, 03 May 2009 - 10:38 AM. Legends spoke of 3 Dedric Lords of Dark Power they argued over the lands of Cyan. One wanted to enslave all of Cyan so he could mine for gold and build an army, while the other wanted to build a giant Dedric tower so he could reach the heavens and become god of the heavens & hell. And the last wanted to destroy Cyan so he could take the triforce and take over the world. They argued over this so much that this created a war many died and was captured . All of the of Cyan crumbled and was deserted and the Dedric lords were never seen again except for the 3rd Dedric lord how survived he was weak but he still wanted to take the triforce in 500 years he will be strong enough to do this . 500 years later a hero was born his parents did not know that there son link was a hero until he started doing strange things, like spells and excellent sword work but they still didn't know that he was a hero. Then when he was 15years old he's adventures began when the Dedric lord awakened.  How I Use this Forums: I use the rules that Nathaniel gave out I use the forums wisely. Edited by Midnight_King, 07 May 2009 - 05:01 AM. You could say that this quest is a remake of Link to the Past. However, it's much more than that. This quest is, essentially, LttP completely re-envisioned. While the bare bones and basics of LttP remain, the rest is completely different. The areas are in the same location relative to each other (e.g. forest in northwest, desert in southwest, etc. ), but most of the areas have been completely redone and made much bigger. All of the dungeons are completely different. Even the storyline has been expanded, with elements from later games introduced. What you see in LttP as it was meant to be. Locked away in the dungeon of her own castle, Zelda turned to her last hope. She telepathically contacted her good friend Link, begging him to save her so they can formulate a plan to defeat the wizard. And so begins the tale. The seven maidens have been replaced by the descendants of the seven races of Hyrule, one from each race. All the dungeons have been redesigned, some keeping their basic themes, and some having all new puzzles and themes. 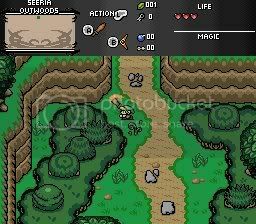 The overworld is much larger, with many areas getting an entire map to themselves. All of the overworld areas, except for Hyrule Field and parts of the Eastern Ruins, have been redesigned from scratch. The remaining areas are modeled the same, but still different enough that you don't feel like you're playing LttP ported to ZC. The Palace of Darkness. The dungeon has been redesigned, with the theme being rescuing Ritos to advance. The Forest Temple. Once again, it has been redesigned. Rather than being one structure, it is a series of buildings and the surrounding forest. Remember the Cane of Somaria rafts in Turtle Rock? Now it's lava cart surfing! A screenshot of the Gerudo Plateau, as it descends down into the Gerudo Valley. Another Gerudo Plateau shot, showing the drying up river. The Lost Woods. Easy to get lost in. Part of Hyrule Field. It's a little bit inaccurate, because Hyrule Castle uses a different palette now. And obviously, one of the screens towards the top left isn't finished yet. The bottom screens of the Eastern Ruins. bobrocks95 (at AGN), who is volunteering to do the dungeons that I don't want to make. Joe123, who made a comment on the first six screens I made that convinced me that they weren't crap and inspired me to keep going. CastChaos, who was nice enough to let me use his Iverted World and Skull Woods palettes. Revfan9, who made the Dark World palette for me. And everybody else who has supported me. Thanks guys! Like what you see? Then vote for me! Edited by Russ, 06 May 2009 - 09:17 PM. I updated the map of the Eastern Ruins. I doubt it will influence anybody's decision too much, but I just thought I'd mention it. Oh, and obviously the northernmost screen on either side of the map is not finished. Two more nights until round 1 is over. There are definitely enough people interested at this point, so there will be no deadline extension unless I surprisingly get busy on Friday night. Most likely it will close late Friday night, close to midnight EST. Day and Age my first large scale quest that I am working on. I hope for this to become a high quality production, that I can be proud to have made. I'm quite an organised person, so a Quest Project Forum would be the perfect way to showcase my quest in an organised matter, so it doesn't get lost in clutter like many quest topics do. I don't promise anything I cannot keep. But I do know, that if given the chance to be in a Quest Project Forum, that I will utilise it to the best of my ability. Hylian legends tell of a young boy, clothed in green. And how that boy drew the sword of Evil's Bane from its pedestal, and struck down a great evil. Thanks to the young boy’s courage, Hyrule was safe. The story of this young boy etched into Hyrule’s history, but the tale eventually faded into a mere legend. Hyrule had been safe for hundreds of years. Until, one day, from the depths of the ocean, the great evil rose once more, and consumed the world with it's greed, anger, and pure evil. It captured the young maiden, Princess Zelda, the rightful heir to the Hylian throne. The great evil then seized the Triforce, and claimed the kingdom as his own. The Hylian could do nothing else but pray to the Gods that the hero shall be reborn, and re-instate goodwill to all the land. Fifteen years ago, a baby washed up on the shores of Sunset Island. But this baby did not have any parents. This baby was concieved from the gods. The only thing thats was with the boy, was a necklace with the name "Link" etched into it. Link grew up with his surrogate grandfather on Sunset Island, far away from the troubles of Hyrule. The people of this island were carefree, and new nothing of the troubles in Hyrule. But their naivety was destroyed when Ganondorf's evil henchmen invaded the island a week ago, and took control. They ordered all men that could wield a sword to be enlisted into the Hyrule Guard. Link's grandfather was taken way, and forced into service. Now Link must find some way to get off the island, and venture the distant land of Hyrule, were he can rescue his grandfather. But when Link makes it to Hyrule, he becomes aware of the much bigger problem that he must overcome; Link must accept his destiny, which will change Hyrule forever, and usher in a new day and age. Will you draw up the Hero’s blade and strike down evil? Or will you succumb to the clutches of evil, and let it take hold of you? DoR 2.0 Tileset, with many new and custom tiles. A large overworld to explore, as well as many little and large islands to find. The option to join the good or evil. You can either choose to fight Ganondorf, or to join him. Lots of cutscenes to maximise the story telling element's of the quest. Many scripts, such as: Real NPC's, Roll, Bombchu, and Sheild scripts. Side Projects: I have many side projects that I work on when my time isn't being taken up by Day and Age, so even if I don't feel like working on Day and Age, I can update the QPF with information about my other projects. Oh, anyways... Vote for Pedro... I mean jimmyb. It was only recently that Ganon was released from his seal. His faithful followers got what they needed: the blood of the warrior who sealed Ganon in the first place! Ganon returns in this fan sequel of AOL, and based-off the hoax from Listen To Me! Link has to stop evil once and for all, and the only way to do it is to obtain the Master Sword. The Sword, however, is broken into 6 different pieces. Its up to you to find them all and reforge the Blade of Evil's Bane and stab Ganon in the face! 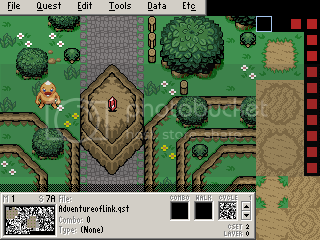 This is meant to be a direct sequel to the Legend of Zelda: The Adventures of Link in NES Style. It will adhere to as many of the NES's constraints as possible, and include it's own 8-bit sound track with music from later games to add that "this was a canceled game" and "OH THATS WHERE THE SONG CAME FROM!" feel. Its important to know that, since this is going to rely on NES styled Graphics, its not going to look as awesome as, say, DOR. 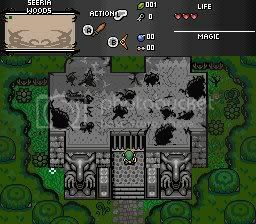 There are 8 dungeons in all, and it pulls a lot of inspiration from both AOL and LTTP. According to the Hoax, the Blade of the Ancients was dropped so the development team could work on LTTP. Edit by Nathaniel: Image was over the 500 dimension limit in length. Converted to url. Edited by Nathaniel, 08 May 2009 - 01:49 PM. Story: Long ago, there was a small land called Hyrule. This place was very peaceful, until one day, a mysterious monster arrived. A monster known only as...Ganon! Ganon tore the land apart. Then, one day, a young boy with a magical blade sealed him away. But a wind mage, in his search for power, freed Ganon. They both had one thing in common. They desired the same thing. The Triforce! The Triforce is three magical triangles; Power, Courage, and Wisdom. It is said whoever collects all three can be granted one wish. But Ganon knew of this. So the Hero of Time, Link, used a magical blade and cast the wind mage into the Dark World, and sealed Ganon in the blade. The seal should have lasted all time, but alas... Link: "That's strange. I could have sworn I felt some evil here. Oh well, let's go back to the castle." Suddenly, the blade broke wide open. Ganon: "At last, I am free! Free from that cursed blade! Free to have my revenge! And Link, I won't have you messing everything up this time!" He casted a spell on Link, and when he awoke, he was somewhere he'd never been before. - Use of Radien's New BS 3.1. - At least three villages. Merging of Ages is my second quest that I'm working on, and I want it to be on the level of other legendary quests-Hero of Dreams, Ballad of A Bloodline, Lost Isle, ect. What a QPF would allow me to do is to give me a place to update on a regular basis, and would help make my quest be known to the greater PZC community. You are an inhabitant of a small, rural town. Events out of your control tear you away from your home, and eventually from the one you love. With nothing left, you venture on in a strange land. What path you take is entirely up to fate to decide. Where you end up in time and space is in the hands of destiny...or is it? - 3 different game paths. You can choose to take the trail of good, the path of treachery or the lesser-traveled road of neutrality. Plus, there will be an extra ending for those who finish all three endings. - All dungeons will have custom bosses (the old-school 2.10 ones). - Secret dungeons for each path. - A future and past overworld. 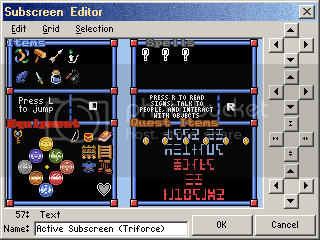 - Lots of cameos, ranging from bosses to random things you encounter on your journey. 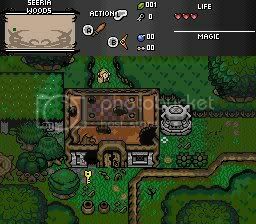 - Pure Tileset plus Custom tiles. - Light's Shadow- a collaboration quest between me and Weasels. So, yeah...enjoy, and I hope you consider me a good candidate for this QPF. Showcase round is now offically over. The poll will be open in less than an hour.